This large airbag sits at the bottom of Superstar Trail, and will allow athletes to train in all four seasons. KILLINGTON—On Feb. 28, Killington Mountain School, Killington Resort, and the Killington Ski Club announced the opening of the largest airbag facility on the East Coast. 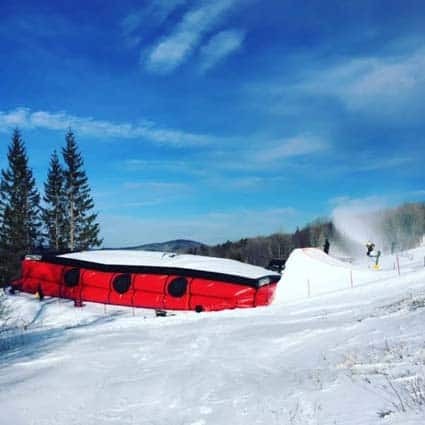 Located at the bottom of Killington resort’s Superstar trail, the airbag is poised to take center-stage at the four-season site. The airbag marks Phase I of the two-phase project. Phase II is scheduled to begin this spring, with a target date of July for comtpletion, allowing the facility to be open in time for summer camp programming. Phase II entails the construction of a ramp with a synthetic surface and a permanent jump, which will enable athletes to use it for training, regardless of snow conditions. This winter’s uncharacteristic weather repeatedly drove the point home that a four-season, non-weather dependent training site is critically important to furthering athlete development. This site, combined with recent implementation of the mid-station on the Snowdown Triple, the purchase of a start gate, and the ongoing improvements to Alpine and mogul training facilities on Highline via the Trails Initiative Project, contributes to the distinction of this venue as the preeminent winter-sports training and competition locale in the East. On the airbag’s opening day, Feb. 28, athletes as young as 6 years old put it to use. Twelve-year-old Freeski athlete Matt LaBaugh was able to land several new tricks on it, and the athletes who used the bag over the weekend felt a tangible progress in their skills in a very short amount of time. The airbag allows athletes to maximize progress in their skill, as they take their tricks from the trampoline facility onto the hill, ultimately enabling them to land those moves on snow.